In Slovenia, the breeding of indigenous domestic animals is becoming less and less attractive, and as many as ten out of 11 native breeds and one indigenous race of domestic animals are endangered. 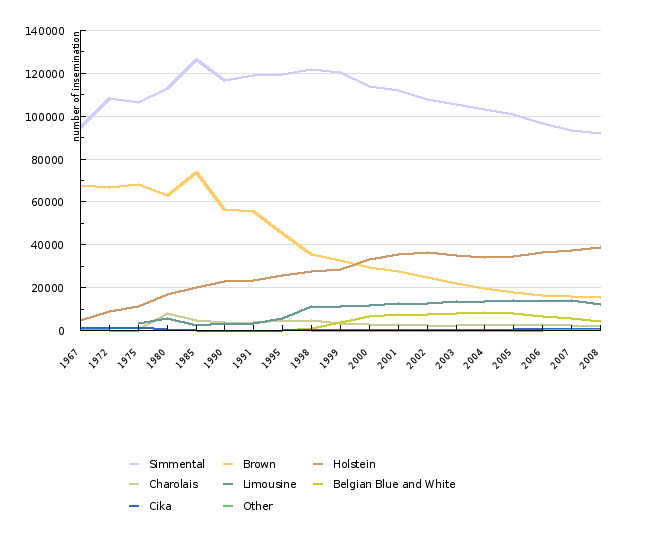 The share of introduced animal breeds and cross-breeds with alien breeds has been increasing. The pressure of introduced breeds is successfully faced in particular by breeds and races where adaptation to natural conditions is particularly important because of the method of breeding (Jezersko-Solčava sheep, Carniolan bee). Nine out of 16 traditional breeds are also endangered. 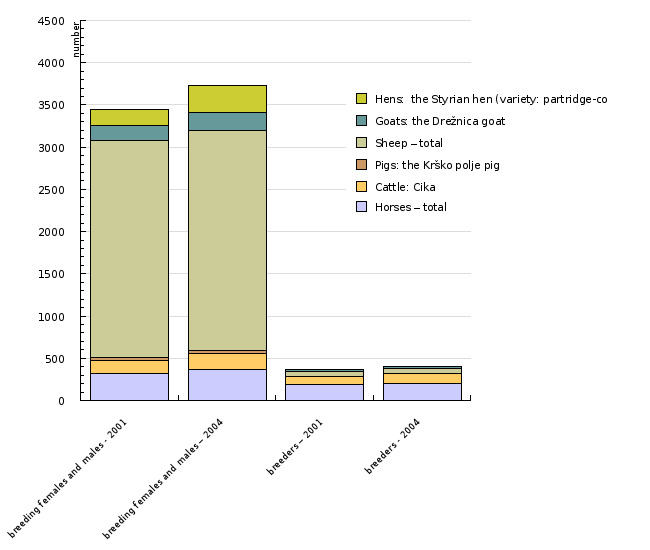 The indicator shows breeds and race of individual species of domestic animals, trends in the number of breeders and farmers involved in the gene bank, trend in the number of breeding female and male animals and farmers included in the gene bank, trend in the number of animals and breeders who applied for agri-environmental payments - breeding of indigenous and traditional breeds of farm animals, and the distribution of breeds on indigenous, traditional and introduced animals. In cattle, the situation is presented by the number of first inseminations by bulls of individual breeds, which is a good indicator of the number of breeding females, and the use of breeding males. As regards the origin, the breeds and race of domestic animals were divided into native, traditional and introduced ones, and as regards endangered species they were divided into endangered and non- endangered. The indigenous domestic animals are those breeds which occurred in the territory of Slovenia. The Slovenian bee Apis mellifera Carnica (Carniolan bee) is also an indigenous race. Indigenous breeds are stated by names of in the Livestock-Breeding Act which sets out the procedure for their recognition. Traditional breeds are those breeds of domestic animals which have adapted to climate and other conditions of a certain area. In the Republic of Slovenia, traditional breeds include those which are under continuous breeding and selection supervision at least fifty years in case of horses, donkeys or cattle, or thirty years for other species. Introduced breeds are breeds of domestic animals that have occurred elsewhere and have not yet adapted to climate and other conditions in Slovenia, or are not under permanent breeding and selection supervision at least fifty years in case of horses, donkeys or cattle, or thirty years for other species. The level of endangered breeds was taken from the register if breeds with a zoo-technical evaluation. Public service tasks of gene bank in animal husbandry, 2006; Central cattle breeding database, 2009; The State of Farm Animal Genetic Resources in Slovenia, 2003. Public service tasks of gene bank in animal husbandry, 2006; The State of Farm Animal Genetic Resources in Slovenia, 2003. Ministry of Agriculture, Forestry and Food, Agency of the Republic of Slovenia for Agricultural Markets and Rural Development , 2009. Central cattle breeding database, Results of Dairy and Beef Recording, 2008. - special care must be paid to locally adapted breeds and race, i.e. to indigenous and the traditional ones. Breeds of domestic animals are part of the natural and cultural heritage. In 1996, Slovenia ratified the Convention on Biological Diversity (Rio de Janeiro, 1992), whose aim is to significantly reduce, by 2010, the rate of biodiversity loss at the global, regional and national levels. Special care must be paid to locally adapted breeds, namely the indigenous and the traditional ones. Due to strong competitiveness in an increasingly open market of livestock products, the breeding of indigenous and traditional breeds of cattle, pigs and poultry is becoming less attractive. Additional pressure results from globalization of the selection of commercially most interesting breeds. In Slovenia, the share of introduced animal breeds and their cross-breeds has been increasing. In addition, the locally adapted traditional breeds are strongly influenced by the purchase of breeding material from other populations by which genes for the currently most interesting commercial properties are being introduced, but these breeds are losing the ability of adjustment to local conditions. In 2008, Slovenia was breeding one race and 177 different breeds of traditional and locally adapted, indigenous and introduced domestic animals, namely 11 breeds of horses, 17 breeds of cattle, 6 pig breeds, 6 sheep breeds, 4 goat breeds, 67 hen breeds, 3 turkey breeds, 11 duck breeds, 7 geese breeds, 45 breeds of rabbits and a race of Carniolan bee. Among them, only 12 were indigenous and 16 traditional breeds, while others (150) were introduced. Most native breeds are with hens (60), rabbits (45) and cattle (14). Among many introduced breeds, at least 3 breeds are endangered – 2 breeds of rabbits and 1 horse breed where the Slovenian selection is being carried out. The level of endangered locally adapted breeds is high. Nine out of 16 traditional breeds are endangered. The endangered traditional breeds include 4 breeds of hens, 2 breeds of horses, two breeds of goats and 1 breed of pig. The level of endangered indigenous breeds is even higher. Out of the total of 12 indigenous breeds of domestic animals, ten were endangered in 2008 - three breeds of horses, sheep and hens, and one breed of cattle, pigs and goats. The pressure of introduced breeds is successfully faced particularly by breeds and races where adaptation to natural conditions is particularly important because of the method of breeding. These are the Carniolan bee and the Jezersko-Solčava sheep, and partly the Bovec sheep. The conservation of endangered native breeds requires the guided breeding and support to the producers of breeding animals. The turning point was the year 1991, when a gene bank was set up, and the professional services joined their efforts to preserve indigenous breeds. Even more important was the establishment of breeding organizations which connect the farmers and lovers of individual breeds. The trends and the number of breeders and indigenous breeds of farm animals were evaluated on the basis of applications for agri-environmental payments - breeding of indigenous and traditional breeds of domestic animals. In 2008, Slovenia had 11 indigenous breeds and one race of domestic animals, namely four breeds of sheep (7,693 animals), 3 breeds of horses (3,207 animals), and one breed of cattle (829 animals), hens (360 animals), goats (288 animals), pigs (566 animals), and the race of Carniolan bee. 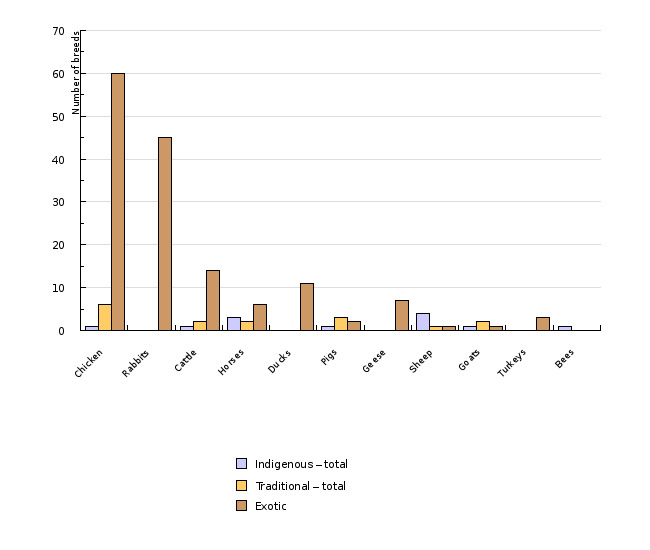 In the period 2004-2008, the number of indigenous farm animal breeds increased in almost all species, by far most in cattle and pigs (over 90%), while the number of goats fell by 12%. In 2008, Slovenia had 1,336 indigenous domestic animal breeders. Most of them were breeding horses (860). The number of breeders in the period 2004-2008 increased for almost all indigenous breeds, mostly for krško-polje pigs where there was 60% more farmers in 2008. 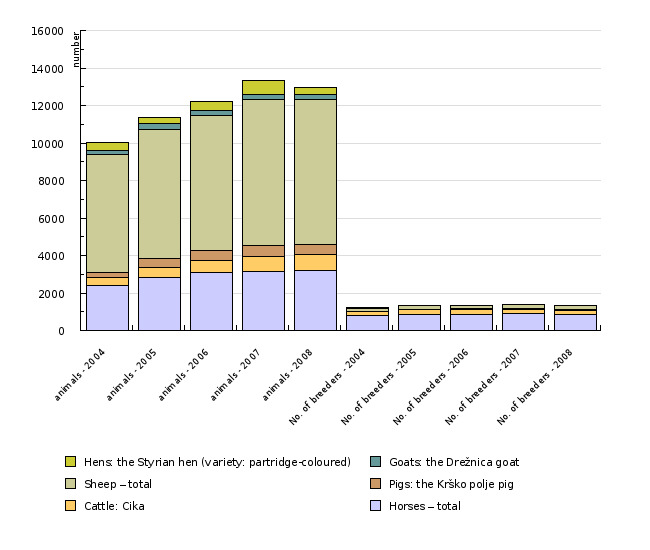 At the same time, there was an increased lack of interest in breeding the indigenous breed - Styria hen - with only 2 breeders in 2008, which is 78% less than in 2004. Slovenia is the original area of the Carniolan bee race. 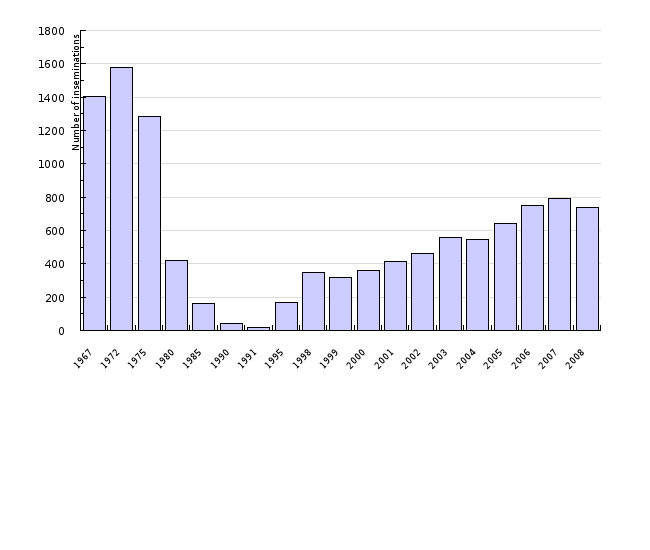 In 2008, there were 7,475 beekeepers that were breeding 137,211 bee colonies. The Carniolan bee is not endangered, but we strive to preserve its original shape. In cattle breeding, which is the most important livestock industry, the number of inseminations with bulls of the traditional Brown race is rapidly declining, and the number of inseminations with the introduced Holstein breed and introduced meat breeds is increasing. Between 1991 and 2008, the number of first insemination with Brown bulls has decreased by 73%. An example of a successful breeding work is the Cika cattle breed where the number of first insemination of breeding cows increased 64 times from 1991 to 2008. The intensified professional work for the conservation of domestic animals breeds and the establishment of gene banks and breeders' organizations have generally improved the situation of endangered breeds. On the other hand, the situation is worse in the case of ordinary traditional breeds not enjoying any special protection regime. Some of them are not able to resist the competitive pressure by more competitive breeds, therefore their number is decreasing. Objectives summarized by: Act Ratifying the Convention on Biological Diversity (Rio de Janeiro, 1992) (OG RS, No. 30/96), Livestock-Breeding Act (OG RS, No. 18/02) and Rules on preserving biodiversity in livestock breeding (OG RS, No. 90/04). Original database: CENTRAL CATTLE BREEDING DATABASE; The Register of Breeds with a Zootechnical Assessment; Register of animals and breeders who have applied for agri-environmental payments – breeding indigenous and traditional breeds of domestic animals. Data administrator: Agricultural institute of Slovenia; Biotechnical Faculty, Zootechnical Department, Public service tasks of gene bank in animal husbandry; Ministry of Agriculture, Forestry and Food of the Republic of Slovenia, Agency of the Republic of Slovenia for Agricultural Markets and Rural Development. Data acquisition date for this indicator: The indicator was renewed in November 2009. Original data, which we used, were processed at the primary source on 31 December 2008 (Central CATTLE breeding database), in January 2009 (The Register of Breeds with a Zootechnical Assessment) and in June 2009 (Agency of the Republic of Slovenia for Agricultural Markets and Rural Development). Methodology and frequency of data collection for the indicator: Central CATTLE breeding database contains data on the breed and the origin of the animals, inseminations, fecundity and production characteristics, transhumance and other. Most of the basic data are collected by the regional institutes of the Chamber of Agriculture and Forestry, and the database is administered by the Agricultural institute of Slovenia. Data are collected and refreshed daily or monthly. Public service tasks of gene bank in animal husbandry manages the gene bank and keeps The Register of Breeds with a Zootechnical Assessment. The latter is refreshed annually. A detailed description of the situation is covered by the publication Stanje živalskih genskih virov v slovenskem kmetijstvu (The Situation of Animal Gene Sources in Slovenian Agriculture) and by other materials on their website. Agency of the Republic of Slovenia for Agricultural Markets and Rural Development keeps the register of animals and breeders who have applied for agri-environmental payments – breeding indigenous and traditional breeds of domestic animals. We obtain the data once a year. Data processing methodology: Breeds and race of domestic animals have been divided according to origin (indigenous, traditional, and introduced) and endangerment (endangered and non-endangered). We summarized the level of endangerment of the breeds from The Register of Breeds with a Zootechnical Assessment, where the level of endangerment is assessed by marks from 1-critical, 2- endangered, 3- vulnerable, 4-at risk and 5- non-endangered (by the Rules on preserving biodiversity in livestock breeding). In the assessment for the purpose of this indicator, we treated the breeds, assessed with marks from 1 to 4 as endangered, and the breeds with the mark 5 as non-endangered. In 2008, we assessed the level of endangerment also for exotic breeds, which are under Slovenian breeding and selection control. Agency of the Republic of Slovenia for Agricultural Markets and Rural Development keeps the register of animals and breeders on the basis of applications for agri-environmental payments – breeding indigenous and traditional breeds of domestic animals. All animals are included there, not only purebred. - Indicator advantages and disadvantages: More than 95% of all cattle in Slovenia are registered in the Central cattle breeding database, and principally all herd animals are registered. Data on the number of breeders and animals of each breed, included in the gene bank, in The Register of Breeds with a Zootechnical Assessment after the year 2004 are no longer reliable therefore we did not indicate the data on the number of breeders and animals in the gene bank for later years. We have, however, introduced a new review on the basis of applications for breeding indigenous and traditional breeds of domestic animals, in which all animals are included, not only purebred. - Results of Dairy and Beef Recording, Slovenia 2008, 2009. Ljubljana, Agricultural institute of Slovenia. - The State of Farm Animal Genetic Resources in Slovenia, 2003. Domžale: Biotechnical Faculty, Zootechnical Department.